SLIGO will have a prominent role in the Paul Clements book ‘Wandering the Wild Atlantic Way’. WAW: The cover of Paul Clements’ new book. The former BBC journalist spent late 2014 and early 2015 along the western coastline of Ireland in what he describes as “bite sized chunks”, with Sligo forming a large part of that. For Paul, writing this new book was in many ways going back in time 25 years when he first did this journey for another book he wrote at that time. 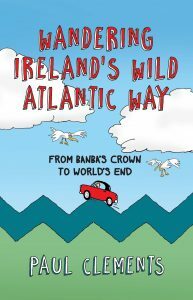 “I hitchhiked the coastline of Ireland about 25 years ago. So I always had this idea that I wanted to retrace my footsteps. The Wild Atlantic Way was a ready made route for me. I also thought it would be interesting to see how things had changed in Ireland,” Paul said. When Paul made his way to Sligo in March, he tried to take in as much of the county as possible and he met some interesting people along the way. For more on this story, see this week’s Sligo Weekender newspaper. In shops now.